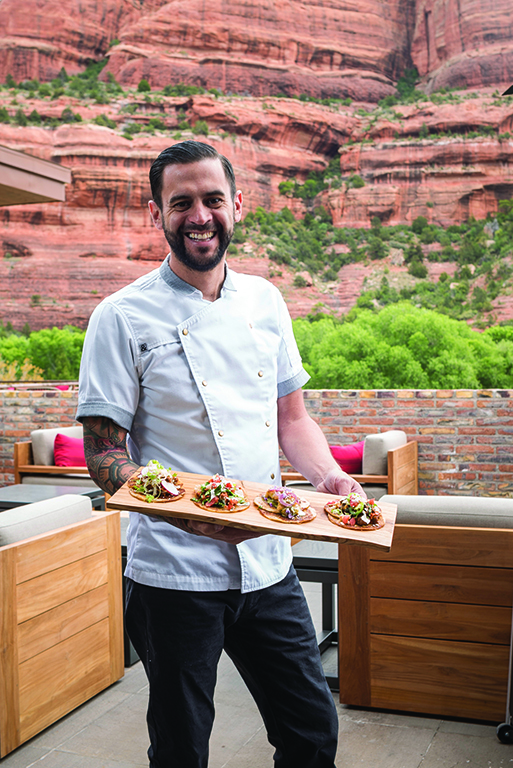 Chef David Schmidt is inspired by his Mexican mother-in-law’s cooking when he creates Tii Gavo’s menu at Enchantment Resort in Sedona. The mezcal swirls in our Mexican Manhattan like smoke from a campfire. We’re 300 miles from the border, the first stop on our journey south, but it feels like we’ve already made it. The air smells faintly of juniper and piñon. The high-desert sun is fading away. It leaves us in the shadows of a rock face that burns red in the dying light. I’m with a friend at the Enchantment Resort in Sedona. He knows, like I do, the way that good Mexican food feels like home. When Jeff and I were growing up in Arizona, we had to search for a hole-in-the-wall to find a good taco. Not anymore. “People from other states don’t know authentic Mexican food. They’re seeking it here,” says David Schmidt, the executive chef at Enchantment’s Tii Gavo restaurant. You might ask how this 38-year-old from Wisconsin, bearded and tattooed, has revolutionized Tii Gavo’s menu with a griddled tortilla. Schmidt’s answer is simple: “I married a Mexican girl.” His wife’s family hails from Michoacán, a seaside state in southern Mexico, and it’s clear right away that their talents have rubbed off on him. 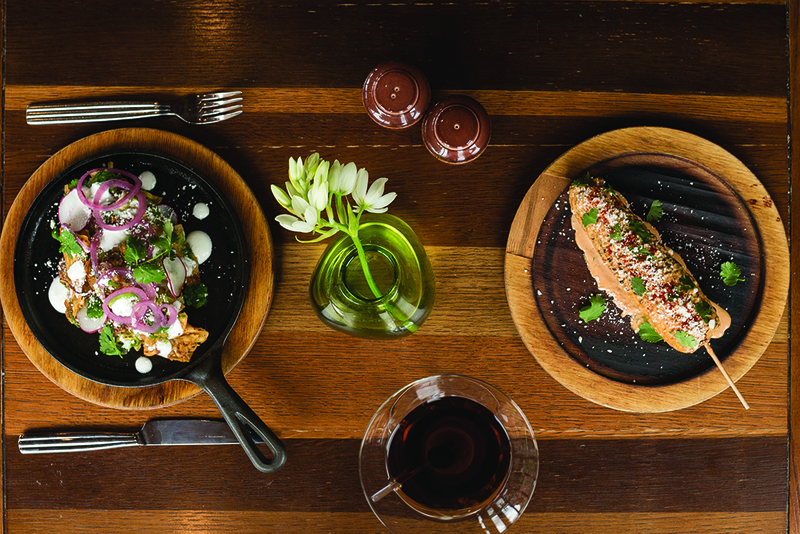 Two ears of street corn come to the table dripping with warm Mexican crema, queso cotija and a confetti of cilantro. 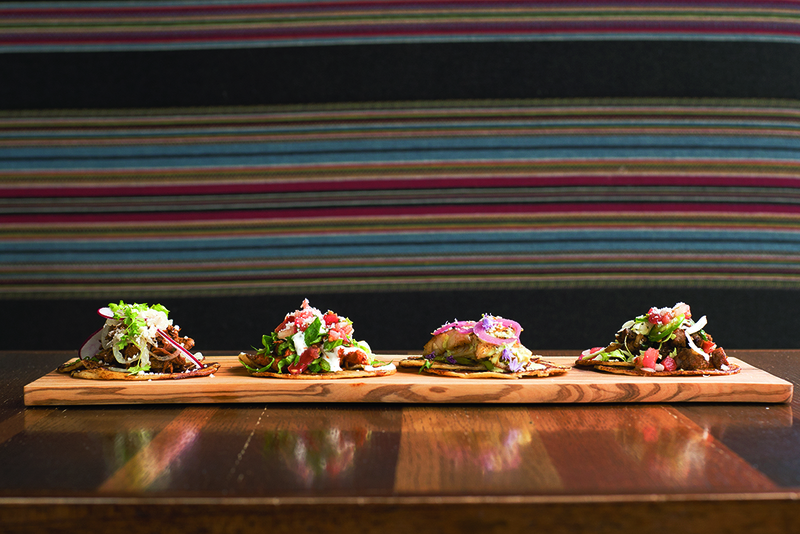 Four of chef David Schmidt’s tacos excepcionales at Tii Gavo restaurant: chicken tinga, prime rib, grilled swai with citrus, and slow-cooked pork belly. 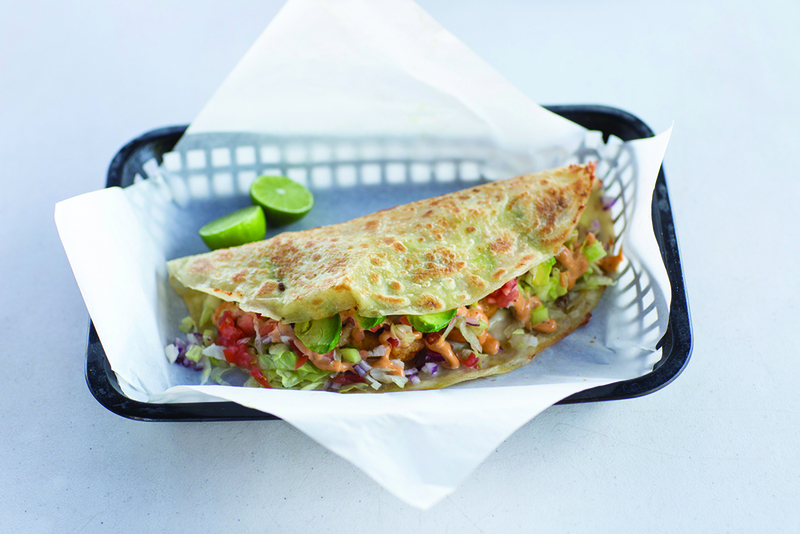 For most of its history, the taco has been an unheralded street food. Food historian Jeffrey Pilcher traces its origin back to 18th-century silver pits in Mexico when miners used “tacos” — explosives wrapped in paper — to extract the ore. Pilcher says that before the 1960s, the taco was essentially unheard of in the U.S. until globalization created the Americanized pre-fried taco shell that has become something of a fast-food cliché. Today, upscale iterations are showing up everywhere, including at luxe resorts like Enchantment that cater to visitors who want a taste of the Southwest. 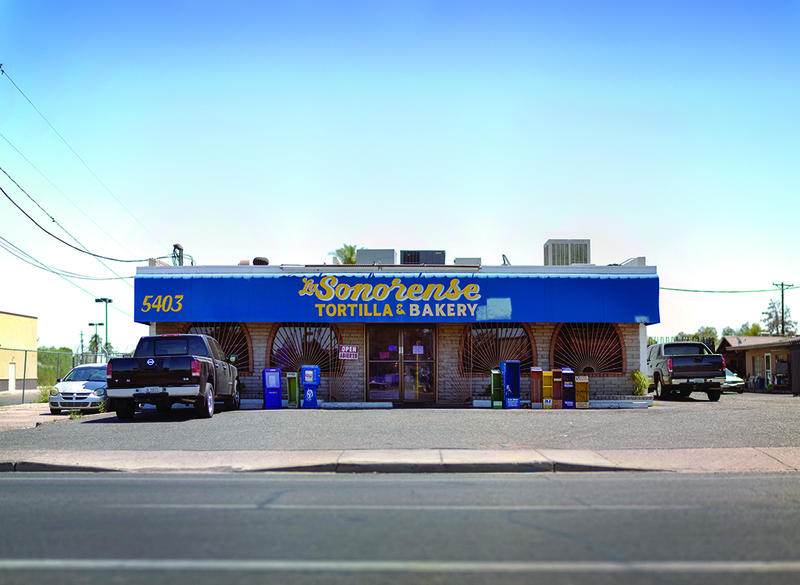 La Sonorense Tortilla Bakery in south Phoenix produces up to a million corn and flour tortillas a week for restaurants and resorts across Arizona. As any good chef will tell you, the key to a perfect taco is the base: the tortilla. Two hours south of Sedona, in a south Phoenix bakery, we get a peek at what it takes to make one right. 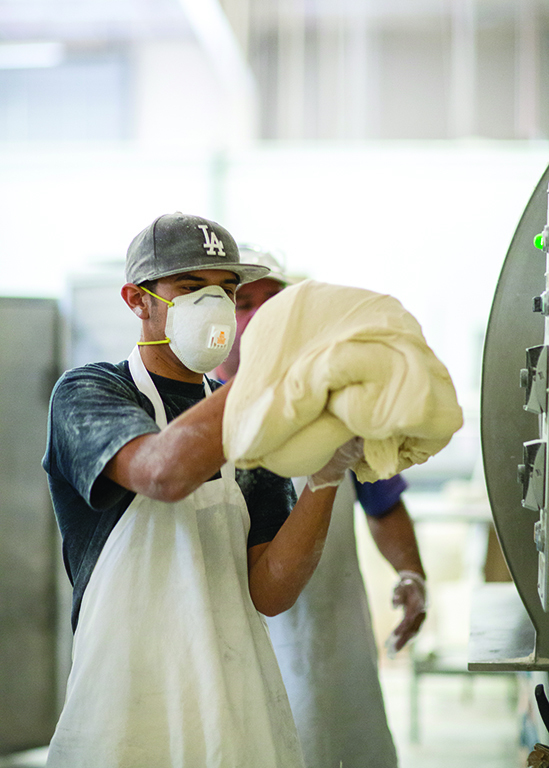 Jose Hernandez and his father — a native of Jalisco, Mexico — have been toiling away in flour dust for decades, “with four to five ladies making tortillas here by hand when we started in 1984,” he says. Now the operation at La Sonorense Tortilla Factory cranks out up to a million corn and flour tortillas a week. Each one is pressed, moved through the oven and cooled on a conveyor belt in two minutes flat (tortilla joke!). Hernandez sells to some of the best resorts and restaurants around Arizona, and when he plucks one off the stack the moment it comes out of the fire, it’s easy to see why. “It boils down to ingredients and love,” he says, handing us the goods, a pillow of flour, water, shortening and canola oil that tastes like hot heaven. We take two bags for the road. The desert changes as we drive closer to Mexico. The junipers are long gone, and now the palo verde trees bloom in the barrios of South Tucson. Barbacoa. Mariscos. Limonada. Like a poem to Mexico, menus are painted by hand on the exteriors of a hundred taquerias. I see a group of old vaqueros emerge from one looking satisfied. Each wears a cowboy hat on his head and I take that as a sign to stop. At the Taqueria Pico de Gallo, I swallow a tortilla stuffed with the soft cheek and head meat of a cow. Down here, they call it cabeza. 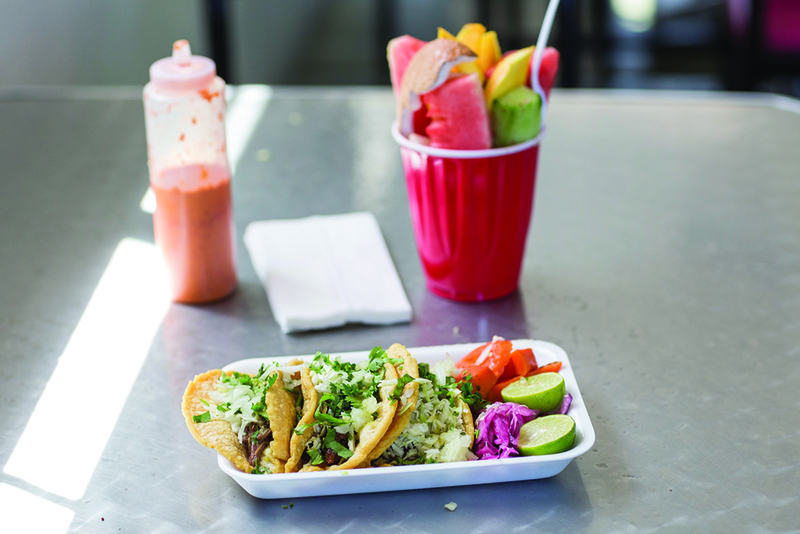 Tucson may be Arizona’s unofficial taco capital, with stands and restaurants serving endless variations, from a hybrid taco-quesadilla to fluffy fry-bread versions at Mission San Xavier del Bac. Our stomachs are full. But we keep going. Two miles away, the focus turns to fish at the Cocteleria La Palma. We may be in the Sonoran Desert, but the Sea of Cortez is an easy drive over the border from Tucson. 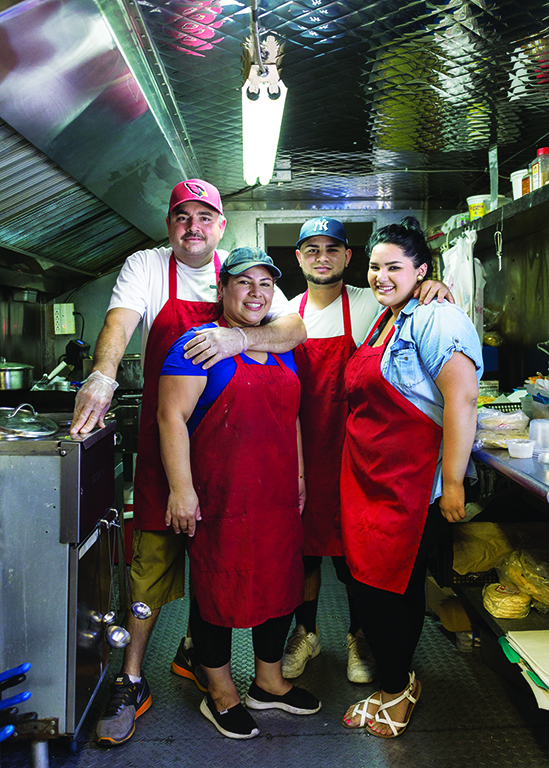 Esther Romero and her husband, Mario, have set up their food truck on a busy street corner, and on the weekends, their two children work the tables to make sure gringos like us are prepared for the kick that comes with the chili de arbol salsa. “Be careful. We made it here. It’s very spicy,” Romero’s school-age daughter says as she puts down a plate of cahuamanta. Translation: stingray tacos. As my friend and I eat our way south, it’s hard to ignore the fact that families are feeding us. It seems like every taco — the best ones, anyway — is served in keeping with a tradition passed down through the years until that moment when it crashes onto our taste buds. 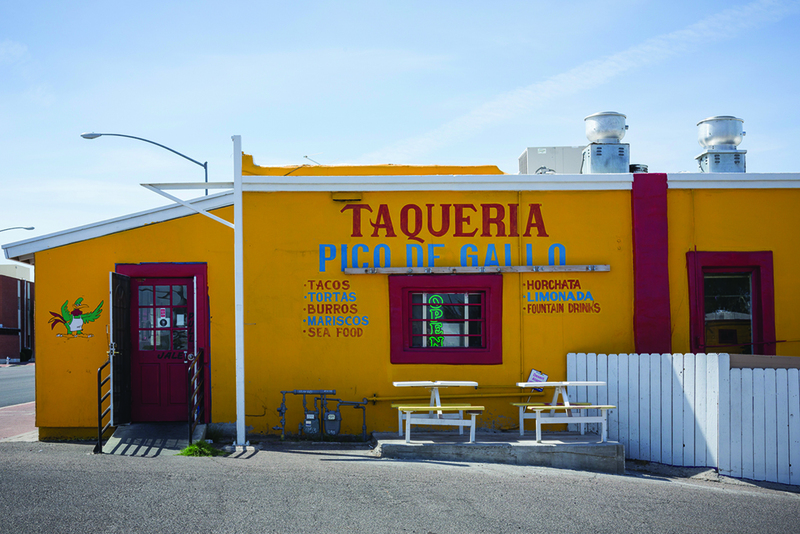 Since the 1950s, Vivian May’s family has been selling fry-bread tacos beneath the same ramada, built by hand from ocotillo branches, a few feet from the Mission San Xavier del Bac. 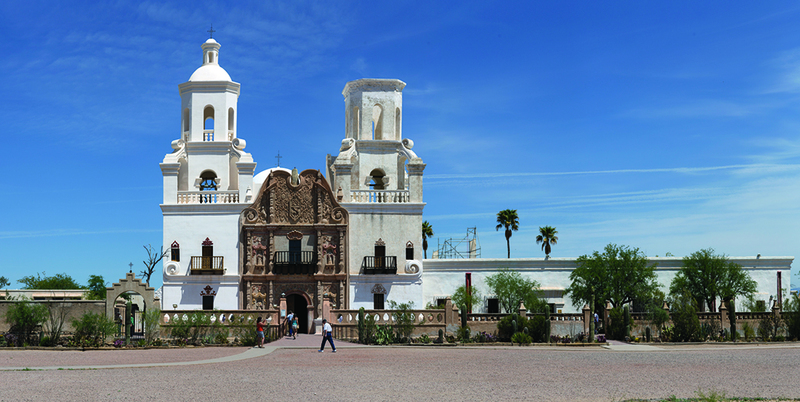 The Spanish colonial church was founded by Padre Eusebio Kino in the late 1600s on what is now the Tohono O’odham Nation, about 20 minutes south of downtown Tucson. Even in the blaze of summer, May and her family will come here to work over a mesquite fire. On a windy day the smoke might blow south into Mexico.